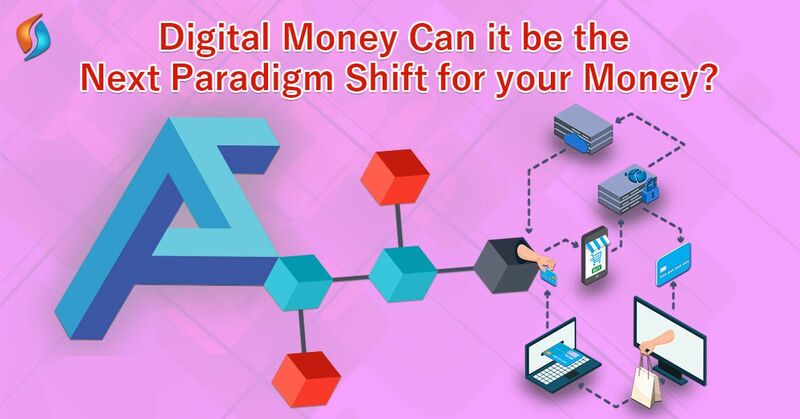 ﻿ Digital Money: Can it be the next paradigm shift for your money? It’s critical to have the right approach when we review digital money for enterprise adoption. Globally, the market is growing at CAGR of 13% with the total transaction value in the digital payments domain exceeding US$3,952,706m in 2019. In India, the mobile payments sector is said to grow at CAGR of 22% to reach around US$ 1,259,449.2 million by 2025. These are lofty goals, with the spark coming from Indian consumers who want to explore ease of convenience. The market must be looked at holistically, owing to the rise of blockchain development services and cloud computing. Digital currencies are becoming ubiquitous, with many banks and financial institutions working directly with blockchain developer communities. As of last year, RBI has also been reviewing the viability of creating a rupee-backed digital currency as well. It has been developing the core technology behind it and understanding the nuances of this crypto-sphere. However, for the typical consumer, Digital money is limited to leveraging online transaction tools. There is no current mandate by the RBI to recognize cryptocurrencies under the legal regime. While it has launched several initiatives for the advancement of blockchain application development, its stance on the core crypto is still under consideration. It is also drafting regulations around the proper utilization of the currency. And is also designing a methodology behind licensing and authorization. The blockchain technology companies and the crypto-sphere is optimistic about the state of digital money in India. However, multiple cryptocurrencies are already in use across the country, for payments and online transactions. Consumers can even purchase goods internationally using digital currencies, as they’re quite popular abroad as well. While there are challenges with scaling up the currency, a digital coin is quite stable. Some of the major markets have been quite stable as of late, with some enhancing upon the core Blockchain technology. This has reduced the cost of transacting to negligible amounts, making digital money even more accessible. Economists and traders are touting digital money as the next big market in the domain of financial transactions. Analysts also have shown recently, that up to 60% of top finance professionals expect significant growth in faster payments, spurred by Blockchain technology. The scale is an essential factor that comes into play when looking at the advancements made by digital currencies. From Bitcoin to Ethereum, the transaction volumes are growing steadily. While there are benefits in using online wallets, there is an additional benefit in using coins because it can increase in value over time. From BHIM to AadhaarPay there is already a comfort level with using digital money. We’ve become accustomed to leveraging digital coins to paying for everyday items. There are many digital wallets including Google Pay, Amazon Money, Paytm and others. While Paytm transactions have reached record highs, the overall goal of becoming a cashless economy is becoming more evident. “We are already seeing a GTV (gross transaction value) run rate of USD 29 billion. We are currently logging about one billion transactions per quarter, and we aim to double it this year. And we will continue expanding the digital payments ecosystem in our country and enabling small merchants to accept payments digitally. We have our commitment to continued investments in our existing businesses, and to build new ones to make India a cashless nation.” – Paytm spokesperson. We can easily streamline the transition from using digital wallets to using digital money. Consumers are already familiar with online transaction technologies and are in sync with the evolving landscape of digital. In addition to this is the rapid growth in smartphones and personal computing devices in India. This gives the perfect opportunity for increased expansion of cryptocurrency development services in India. For a digital transaction to be fully secure, it’s essential to have a blockchain development company to be working within the framework. Companies such as Signity Solutions, develop crypto wallet solutions for organizations and individuals that want to handle their money. Blockchain technologies have made it easier to create wallets that are more secure than the ones freely available. The Blockchain community has made the utilization and storage of digital money that is much more secure. Even at the transaction phase, the speeds at which these currencies are dealing with is incrementally superior. And an increase in bandwidth and connectivity is enhancing the overall purview of Blockchain based digital currencies. Any top blockchain developer in India will tell you that digital money is a widely growing area. Some of the leading financial institutions are focusing on the core technology at scale. “Blockchain technology has broad implications for the commercial payments space, from speeding up settlements to securing cross-border transactions. Even though much of the industry has a baseline understanding that blockchain can evolve and improve payments, the varied responses indicate that the technology’s specific capabilities and implications are still a great unknown for many finance professionals.” -Rick Burke, Head of Corporate Products and Services at TD Bank. The community, the talent, and the blockchain developers are making Blockchain scalable for all digital markets. Signity Solutions, a leading custom web, mobile app development company in India, works with international players on developing a premier blockchain based financial products. From Blockchain based digital coins to Bitcoin-enabled e-commerce platforms, we are supporting much of the innovation happening in the blockchain sphere. With a professional team and many years of experiences, you will get the best guidance here. Contact our IT outsourcing services today!